Before I forget what I did | carpe diem! 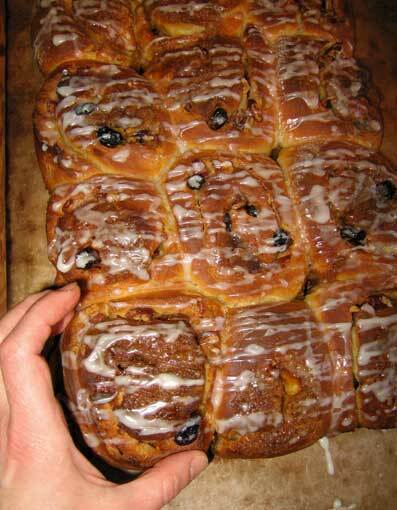 Here’s a recipe for cinnamon-pecan-raisin sticky buns. With the dough rising at cool room temperature this batch took about 8 hours from start to finish; I made the dough at about 0900 and took the end result out of the oven at about 1700. I froze half, and we’re eating the rest for weekend breakfast reheated sticky-side-up in a 100°C oven for about 8–10 minutes. I used a pan 13″x8″x1.5″; if you can fit a pan that size in your refrigerator, then you could try starting the dough at about 1800, leave to rise 4 hours or a little less, make the rolls and arrange them in the pan, then leave them to rise in the refrigerator overnight (I suggest putting something to catch overflowing sugar syrup under the pan, just in case). The next morning, set an alarm for about an hour before you want to get up, stumble downstairs, take the pan out of the refrigerator, set the oven to 375°F, go back to bed. When you do get up, put the rolls in the oven before you start making coffee and they’ll come out of the oven hot, indigestible, and completely delicious about 30 minutes later. The recipe started with Greenstein’s ‘Sweet Rolls’ in Secrets of a Jewish Baker. There are a lot of interesting breads in there, and it seems to be much cheaper now than when I bought it! rum, at least 1 tbsp, but add up to another tbsp as you knead if you can manage the softer dough. a dribble of hot water to make a drizzleable paste. Note: I lined the pan with non-stick teflon paper before doing anything. If you can, do, as this makes it much easier to get the buns out. If you haven’t got any you’ll need to pay some attention when you’re turning the buns out of the pan (more detail at the time). Mix all the dough ingredients together. If you’ve got a breadmixer, use it, but I knead by hand. Not the two-handed wrist-flexing method my mother used for bread and clay, but the technique I was taught by a professional baker. You’ll need a straight-edged dough scraper, ideally with a flexible blade (the stiff blades are a pain for this), or improvise with a piece of perspex, windshield ice-scraper… anything that will scrape the dough along the surface without cutting into the surface the way a knife blade might. With the scraper it’s simple: dump the dough on the surface and put the heel of your hand in/onto it, then drive the heel of your hand away across the table. 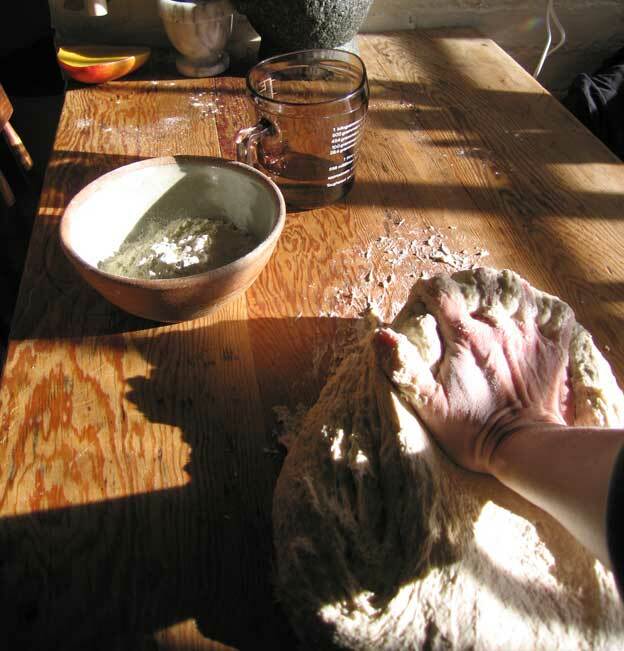 Feel the dough stretching and breaking as it’s trapped between your hand and the table. Push from your shoulder, not your wrist or elbow; it’s a straight-arm power move. This photo isn’t bun dough, I didn’t think to take a picture. It’s sourdough bread dough from one I made earlier. While the dough is rising, make the sticky: mix the sugar and butter together to make a thick gooey paste and put 12 big dollops of this in three rows of four down the pan, roughly where you plan to put each roll. Put a couple or three pecans on top of each lump. When the dough is doubled, flour your work surface and pat/pull/spread the dough into a rectangle about 12″ wide, 16-18″ long and just under 1″ thick (those measurements are guesswork and memory, but the proportions are roughly right and the details really don’t matter too much as you’ll make 12 rolls regardless). Leaving about 1/4″ clear along one long edge, drizzle the melted butter evenly over the surface and spread with a brush/spoon. Sprinkle the cinnamon sugar, the chopped pecans on it. Dot the raisins as a surprise for raisin-lovers in your life. Work a little cold water gently into that clear strip to make it sticky, then roll up from the other long side. Press/pinch the join to hold it together. Press a sharp knife into the centre of the cylinder, then divide each half into half, then divide each quarter into three (feel free to use a measuring tape, I used to). The end rolls will be slightly smaller than the middle, which makes it easier to be slightly less self-indulgent, or subtly penalize someone who has offended you. Place one bun-to-be on top of each dollop of sticky, remembering to mix big and small in each row (if you cram all the centre buns in one place, they won’t have room and the little ones will be lost and sad). Leave to rise for another three to four hours, until the buns have joined at the edges and are looking puffy and, well, risen. Preheat the oven to 375°F over the last hour. bake until the tops are really well-browned. While the buns are in the pan it’s hard to check that the toffee base has worked so what I do is: remove the buns from the oven when the tops look done. Leave sit for about a minute, no more than three, to allow the toffee to set a little bit, then run a knife around the edge of the pan and turn the buns out as a slab, scrape any toffee left behind off the pan and apply to naked bun-bottoms. If you haven’t used teflon paper and you wait too long, the toffee will stick the buns to the pan; if that happens, carefully and evenly heat the bottom of the pan over a low burner to melt the toffee a bit, then turn out. Best to avoid this if you can. If, when you’ve turned the buns out, the toffee isn’t quite toffee enough, you can put the entire slab under the grill for a couple of minutes to properly melt the sugar and butter. Watch like a hawk to ensure nothing burns. By this time the smell will be driving you mad, so as the toffee sets, turn the buns over, drizzle icing over the top and rip the slab apart like slavering wolves falling on a hapless caribou. Or hungry people on fresh cinnamon buns. This entry was posted in Uncategorized on March 28, 2009 by sarahw. mmmm tasty. Good job we have just eaten tea but I might give those a try!